We've heard you! 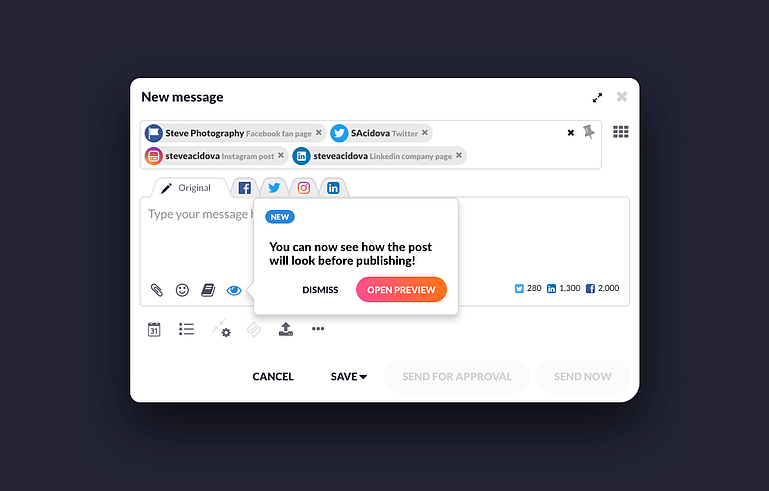 📣 The ability to preview posts has been our #1 feature request on our idea platform for a while now and we're thrilled to announce that it will be live very soon! We know how important it is for you to see how your messages will look on different platforms to ensure you always publish top quality content. This feature will make it easier for you to personalize text, find the right text length and make sure your pictures look as dazzling as intended! When composing messages to Facebook, Twitter, LinkedIn and Instagram, you will soon be able to preview how your posts are going to look on these social platforms before you post them. We will be adding a new icon to the Compose Box to launch a Post Preview modal when clicked. The new Post Preview feature will accurately render a preview of the post before it is published, allowing you to easily amend the post according to how you want it to look.